I’ll be at the University of Texas at San Antonio in November giving a talk as part of the Educational Leadership & Policy Studies Distinguished Lecture Series. 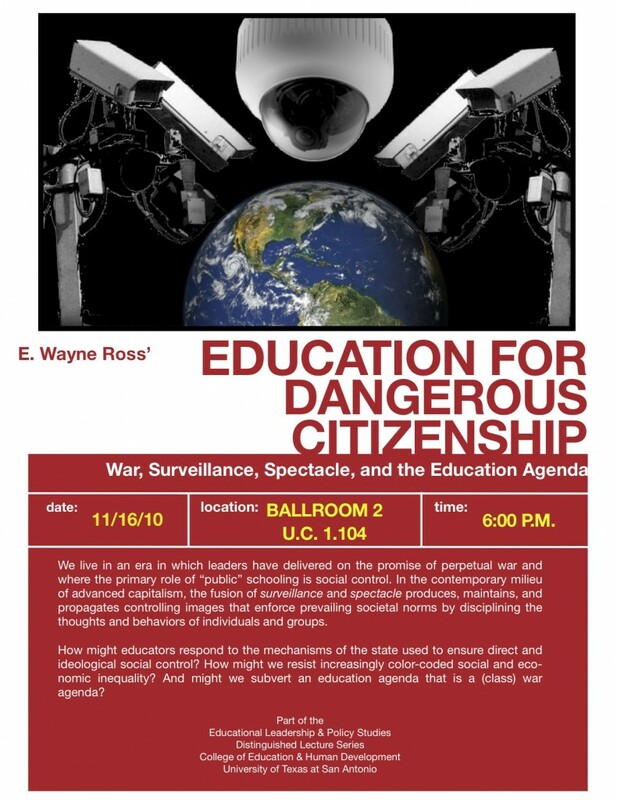 The talk, titled “Education for Dangerous Citizenship”, will draw from some of my recent work with Rich Gibson (e.g., “The Education Agenda is a War Agenda” and “No Child Left Behind and the Imperial Project”) and Kevin D. Vinson (“The Concrete Inversion of Life”: Guy Debord, the Spectacle, and Critical Social Studies Education” [pdf]). The UTSA talk will cover some of the foundational ideas for a book Kevin and I are currently writing titled Dangerous Citizenship: A Theory and Practice of Contemporary Critical Pedagogy. Thanks to Abraham DeLeon for organizing things at UTSA. We live in an era in which leaders have delivered on the promise of perpetual war and where the primary role of “public” schooling is social control. In the contemporary milieu of advanced capitalism, the fusion of surveillance and spectacle produces, maintains, and propagates controlling images that enforce prevailing societal norms by disciplining the thoughts and behaviors of individuals and groups. How might educators respond to the mechanisms of the state used to ensure direct and ideological social control? How might we resist increasingly color-coded social and economic inequality? And might we subvert an education agenda that is a (class) war agenda?